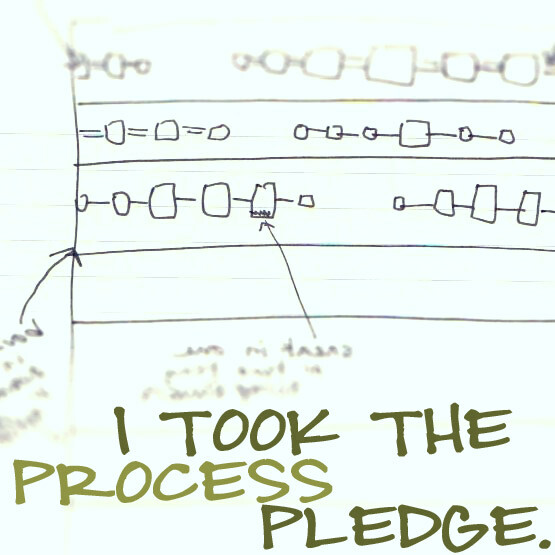 The next step is turning the + blocks into * blocks. 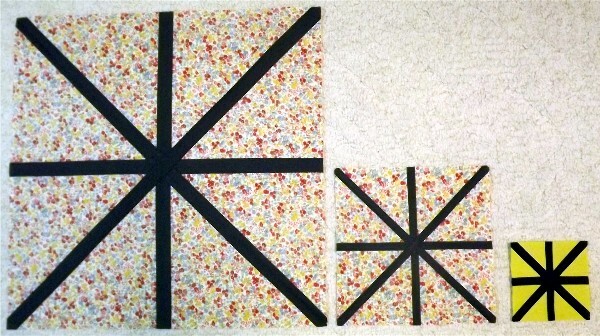 For the smaller quilt, both the small and large blocks use 1″ cut strips for the “iron” or black fabric. 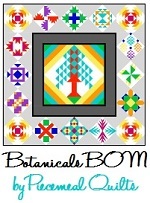 The large quilt uses 1″ cut strips for the smaller blocks, and 1 1/2″ cut strips for the large blocks. Start by cutting the blocks diagonally. 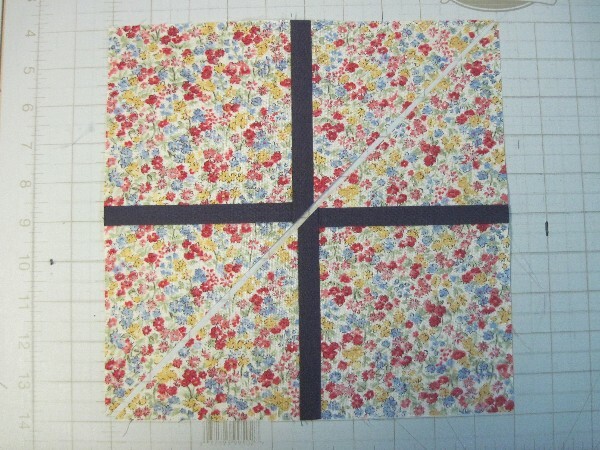 If you are making the large quilt, the jumbo block is a little more challenging to cut diagonally. 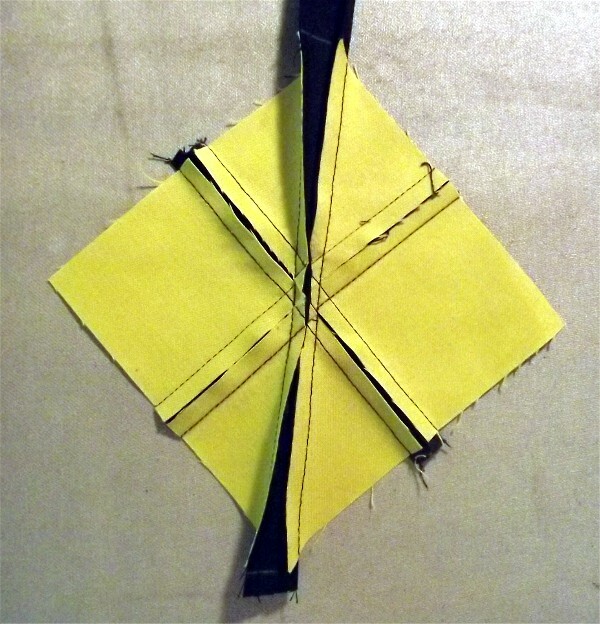 Fold it in half diagonally, corner to corner, and align the folded edge with a line on your cutting mat. Slide left or right until the point lines up with a perpendicular line. Place your ruler (in this photo I’m using the straight edge that comes with the cutting tool, but you can just use a regular ruler) on the fabric so it aligns with the line on the mat that goes through the point. Make sure it aligns with that same line at the folded edge as well, then cut. 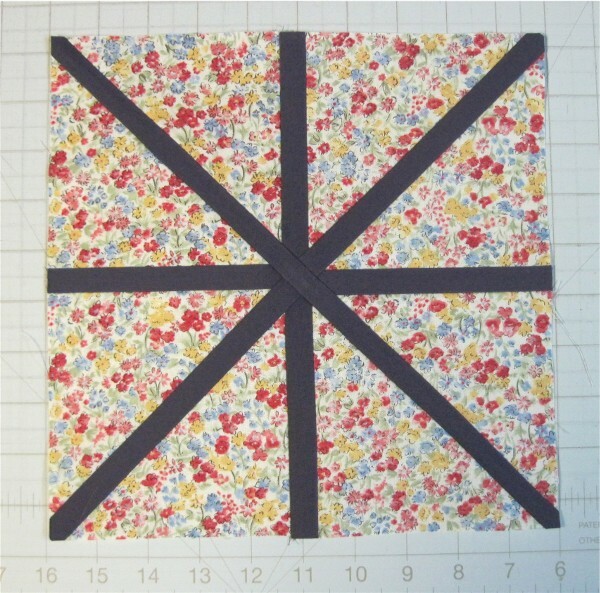 Sew one half of the block onto a black strip, chain piecing just as you did in the last post. 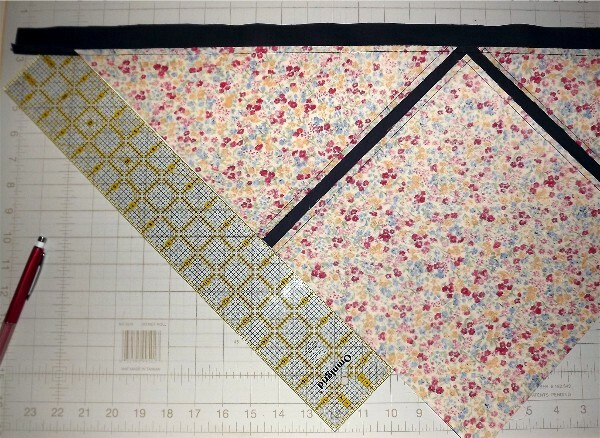 Add as many as you can to a single strip, but leave a little extra room, maybe an inch, between the pieces. For the larger blocks (the ones that finish at 20″) you might want to increase that 1 1/2″. Remember, only sew half of these to the strip! Lay the piece WRONG SIDE UP on your cutting mat, aligning the piece with the 45 degree lines on the mat. This is where you will line up the point of the other half of the block. 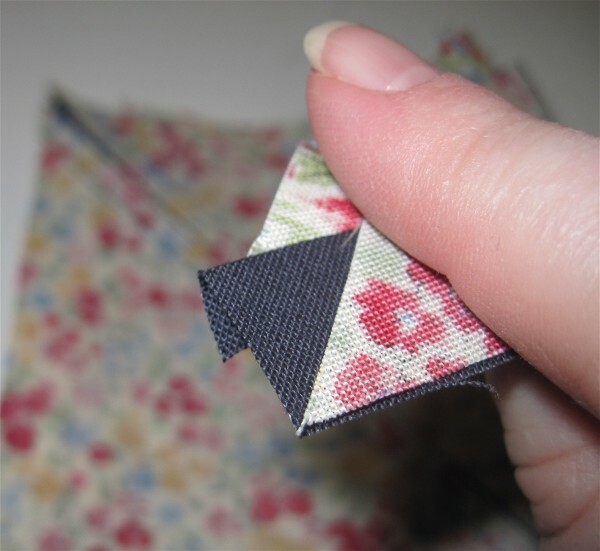 In the picture below, I’m showing how the other half of the block is lined up so the tip of the point just touches the edge of the black fabric. 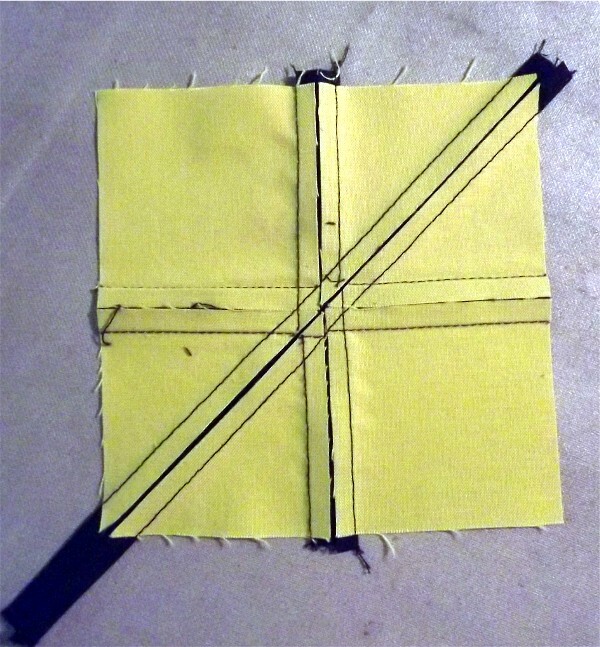 Sew each of the second halves to the blocks and press to the black. 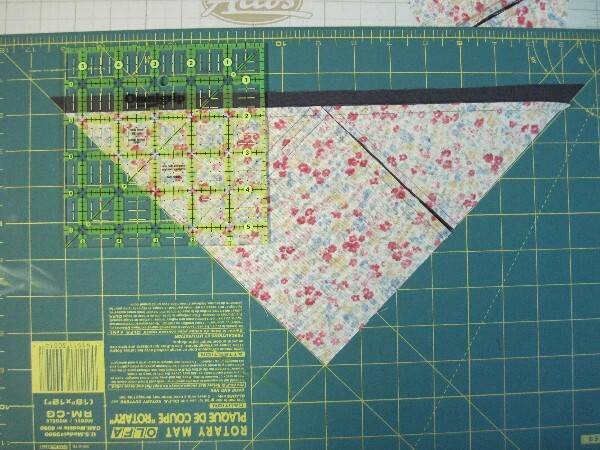 For the jumbo block in the large quilt, it may help to extend the lines on the cutting mat with a ruler, as shown below. 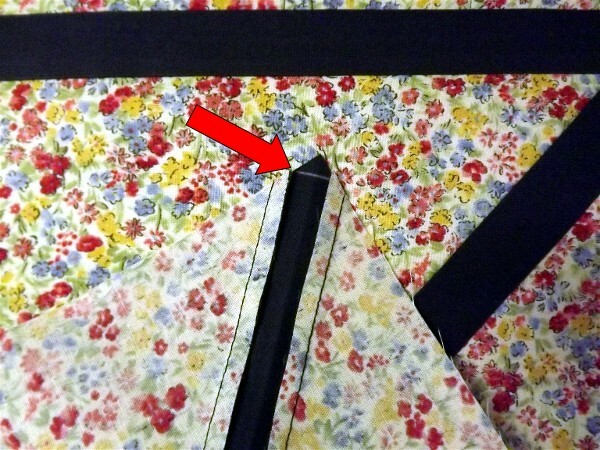 The two pressing photos below illustrates how much “play” there is in the seam allowances. The first photo of the smallest block looks like the seam allowances are going to bunch and overlap. With a little nudging and pressing, instead they lay completely flat. 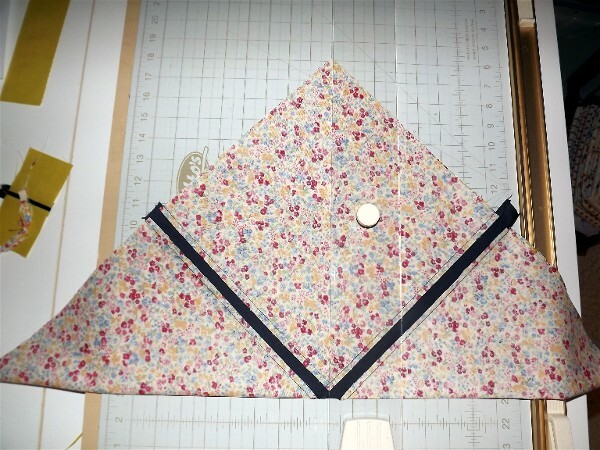 After you’ve sewn and pressed each of the blocks, repeat the diagonal cut in the opposite direction. For the largest blocks, you may want to lightly press it in half to give you a straight edge to line up on the cutting mat. 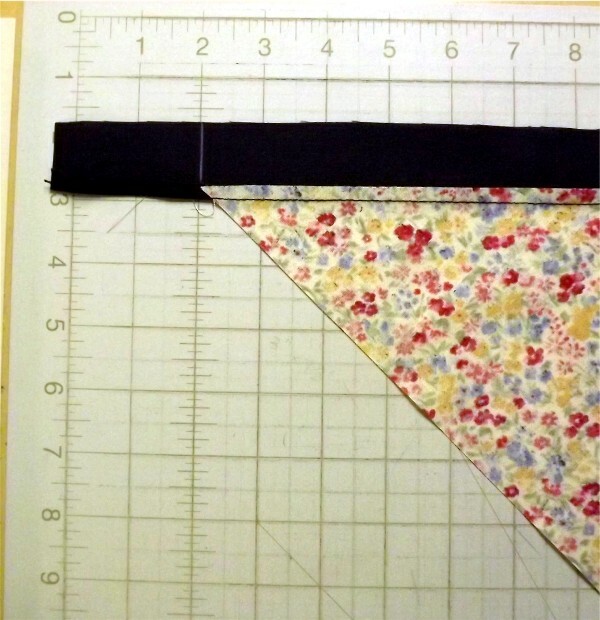 As before, draw the line (or trim for the smaller blocks), sew one half to the black strips, leaving a little space between them, then sew the other halves to the opposite side of the strip. Trim your blocks to size. 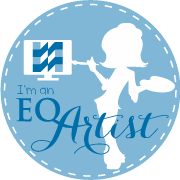 They should be pretty close already – the smallest blocks are 5″, the medium sized blocks (used in both the small and large quilt) are 10″ and the largest blocks are 20 1/2″. 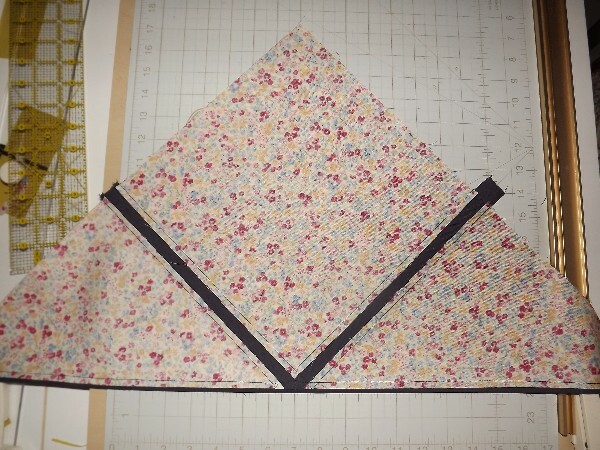 In the photo below of the largest block, you can see why you want to draw the line rather than trimming to the point – if you’d trimmed, you would have cut off fabric at the corners! Trimming the largest blocks are a challenge – just work one side at a time and use the lines on the mat to keep your block square. And here they are: one block in each size! Cool! And I am caught up and ready now, too. Loving how it’s going together! I love the look of these blocks. 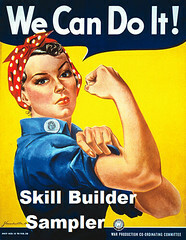 I may have to join in and make some of my own.